Wednesday, April 18th, from Noon to 2 p.m. NOTE: Noon Meeting Time means BYOBB “Brown Bag” if you want lunch! Federal Reserve Bank of Boston, 600 Atlantic Ave., Boston, Harborside 4th Floor, Paul Connolly Center Room. Just across the Street from South Station. Expect standard security screening of your bag and person at the entrance. Many Massachusetts towns have made progress in implementing renewable energy initiatives to generate electricity for municipal use. Outside of the Solarize Mass pilot communities, little has been done yet to address renewable energy for residential and small business consumers. Learn more about Solar Gardenresidential and small business opportunities! Joy Hughes, CEO of the Solar Gardens Institute. She will explain the SGI model which combines community and third party ownership in a large solar array, located on rooftops or open land. Large investors who stand to reap substantial tax benefits from large community arrays join forces with individual subscribers, including low to moderate income individuals who, over time, acquire equity ownership. She will be sharing what SGI has learned from projects in Colorado, California and New York. Joy lives off the grid in Colorado. Jay Silva, an energy consultant and member of Sustainable Scituate and the Scituate Renewable Energy Committee will also speak. He has been a key player in Scituate's involvement in the Solarize Mass Pilot, a solar PV group purchase program managed by the Mass. Clean Energy Center. He will address the strengths and limitations of the Solarize Mass strategy and describe how the solar garden concept will act as a complement to Solarize Mass. He will also specifically address how the SGI model might play out in aMassachusetts scenario. 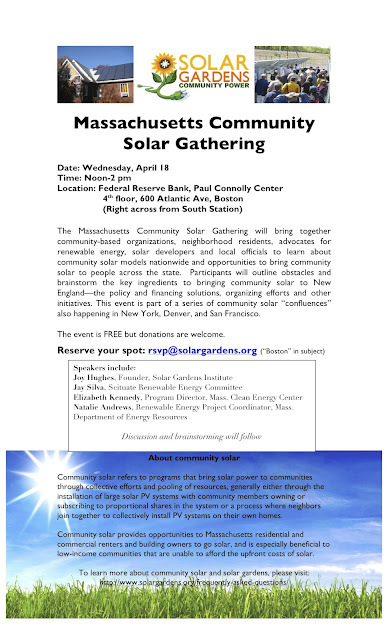 Elizabeth Kennedy, Program Director of Renewable Energy Division of the Massachusetts Clean Energy Center will speak briefly about the Solarize Mass program and how that program led someMassachusetts residents to explore Solar Garden opportunities. Natalie Andrews, Renewable Energy Project Coordinator and Manager of the US DOE “Sunshot” Grant for the Massachusetts Department of Energy Resources will speak briefly about how the DOE Grant will enable the Green Communities Program to work on community Solar Gardens. Also Short Presentation from: Gabe Shapiro of Next Step Living about their new residential solar program. Phone-in option for this meeting will not be available but briefing materials on Solar Gardens will be posted on the MCAN website shortly after the meeting. At top of ramp, continue straight on Purchase Street; at the 2nd set of lights, turn left onto Congress Street. The Bank is ahead on the right, at Congress Street and Atlantic Avenue. Take Exit 20 “Logan Airport/Worcester/South Station” and follow South Station ramp. At 2nd set of lights, turn right onto Kneeland Street; continue to the end and take a left onto Atlantic Avenue. The Bank is approx. ½ mile ahead on the right, at Summer Street and Atlantic Avenue. Take Exit 24A “South Station." At end of ramp, continue straight on Atlantic Avenue. The Boston Fed is easily accessible by the MBTA's Red and Silver Lines. Take the Red or Silver Line to the South Station stop. The Bank is the tall silver building located at the corner of Summer Street and Atlantic Avenue. Attending? Email rsvp@solargardens.org with subject "Boston"